The Pepperdine University School of Public Policy commemorated two decades of academic excellence with a dinner celebration at the Ronald Reagan Presidential Library in Simi Valley, California, on November 4. Esteemed members of the Pepperdine community, including administrators, faculty, staff, and alumni, addressed the audience throughout the evening, each one uniquely exploring the theme “A Way Forward” as it relates to the University, local and national governments, and the United States. 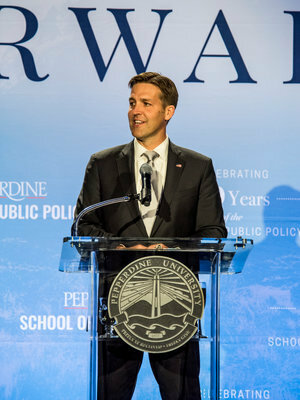 The Honorable Benjamin E. Sasse, United States senator representing Nebraska, served as the featured guest speaker. Charity Wallace, fellow member of the Board of Visitors, delivered the invocation following Czyzyk’s remarks. Associate professor of public policy Luisa Blanco Raynal, who celebrated her own School of Public Policy anniversary earlier this year when she marked 10 years as a faculty member, led the audience in the Pledge of Allegiance. Won by One, Seaver College’s a cappella singing group comprising six undergraduate students, performed the national anthem. Exploring the idea of hope in times of challenge, , Pepperdine University president Andrew K. Benton recognized the ideals of those who envisioned a great future for this country and celebrated the virtues necessary to help drive true democracy. To learn more about the mission and vision of the School of Public Policy, visit the School of Public Policy website.